Economy Peaches & Cream Fish Food - An economy version of the ever popular Peaches & Cream Fish Food (Click bag image for a closer look). Peaches & Cream Fish Food - The UK's top selling pond food. This is a complete two colour floating food stick that does not need supplementing. It encourages healthy growth and its added colour enhancer brings out the best in your fish. It has added vitamin C to improve your fish's immune system and help them fight infection. Your fish will love it! Superior Jumbo Mix Fish Food - This complete fish food is a mixture of 16mm and 22mm pellets. 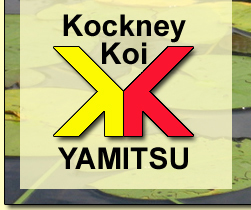 Like all Kockney Koi foods it has added vitamin C to improve your fish's immune system. Feeding the smaller fish with a larger pellet encourages the fish to spend a greater time at the surface, making them tamer and enhancing the beauty of your pond. Bombay Mix Fish Food - A complete food for all sizes of pond fish. Bombay Mix consists of a blend of sticks and pellets from 2mm to 16mm. It is ideal for ponds with a mixture of sizes and types of fish. It is designed to encourage healthy growth and bring out the best in your fish. It has added vitamin C to improve your fish's immune system. Fish simply love it! Red Pond Stix Fish Food - This is a complete floating red food stick. This is our highest protein, colour enhancing stick. It is supplied in a convenient 11 litre resealable, weatherproof tub. It encourages healthy growth and its added colour enhancer brings out the best in your fish. Made to the exacting Kockney Koi standard. Superior Mix Fish Food - Available in a size to suit your fish. When you are looking for a specific size pellet this is the food for you. This complete fish food is available in 2mm, 4mm, 6mm, 8mm and 16mm to enable you to select the best size for your fish. Like all Kockney Koi foods it has added vitamin C to improve your fish's immune system. 16mm is unavailable in 500g Retail Pack. Superior Stix Fish Food - A high quality complete staple fish food. This floating food stick does not contain colour enhancer enabling us to reduce the price. It is a staple food designed to encourage the healthy growth of your fish. It has added vitamin C to help keep you fish in top condition. 8 out of 10 fish that stated a preference said "IT TASTES YUM !" Show & Grow Fish Food - Our highest quality Koi Food. This superb food has been used by top Koi keepers for many years. Its is complete food with 39% protein and extra spirulina (a superior colour enhancer) and of course added vitamin C. It will increase fish growth rates and enhace their colour. It is available in 4mm and 7mm pellets. Koi Cakes Fish Food - The ideal food for taming your fish. These floating hand feeding treats have been specially formulated to help you tame your fish. They can be used as a hand feeding treat for the larger fish while smaller fish will spend time pecking at them. Over time your fish will become more confident and less wary of remaining at the surface. Sturgeon & Tench Fish Food - For sturgeon in mixed carp ponds. This sinking food is ideal for Sturgeon when mixed with Koi carp etc. It can be fed to your fish all year round as it has a low (for sturgeon) protein level and added wheatgerm to reduce the chance of harm to other breeds such as Koi carp that cannot tolerate high protein levels in the colder months. Wheatgerm Winter Fish Food (Floating Pellets) - This is a complete low protein floating pellet that should be fed to fish during the colder months when your fish must not be given as much protein. It has added vitamin C to improve your fish's immune system. Full feeding instructions are provided on the bag. Ensure your fish have a great winter. Wheatgerm Winter Fish Food (Sinking Pellets) - This is the sinking version of our highly popular floating pellet. It is a complete low protein sinking pellet that should be fed to fish during the colder months when your fish must not be given as much protein. It has added vitamin C to improve your fish's immune system. Winter Stix Fish Food (Floating) - If your fish prefer sticks over pellets than this is the winter food for them. It is a low protein floating fish stick ideal for fish during the colder months when they must not be given as much protein. Like all our foods it has added vitamin C to improve your fish's immune system.